The Food Co-op in Katoomba is celebrating its 30th birthday, making it probably the oldest in NSW (Afalfa House in Enmore is the other co-op in the running) and on of the oldest in Australia (Maple St Co-op in Maleny QLD was founded in 1979). Founded in a garage in 1980, the co-op has thrived in its current location in Ha’penny Lane since 1998. 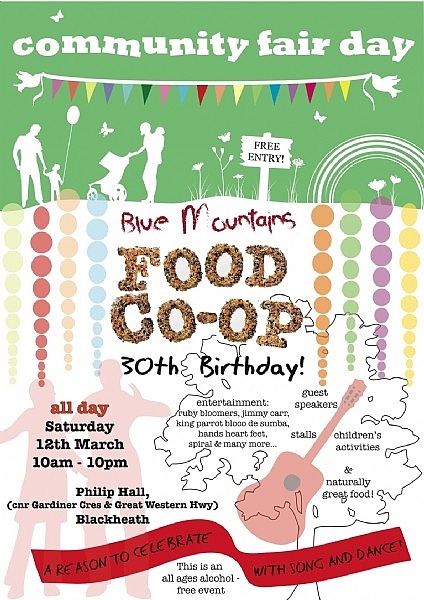 To celebrate 30 years, a Community Fair at Philip Hall Blackheath is planned for Saturday 12th March with entertainment and events from 10am to 10pm. Entry is free. This entry was posted on Tuesday, March 1st, 2011 at 8:42 am	and is filed under Events, Mountains Life. You can follow any responses to this entry through the RSS 2.0 feed. You can skip to the end and leave a response. Pinging is currently not allowed.